LONDON - Scotland and China signed a $10 million renewable energy technology licensing deal on Sunday, the Scottish government said, as Chinese Vice-Premier Li Keqiang began a four-day state visit to Britain. The contract will allow technology pioneered in Scotland to be used to generate power from domestic rubbish at a plant in China, the government said in a statement. 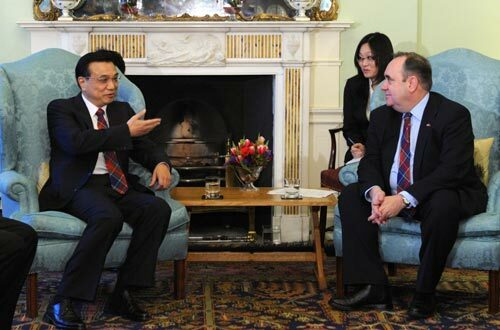 Scottish First Minister Alex Salmond said the agreement was sealed between Sino-Scots firm Shanghai Huanuan Boiler and Vessel Co/Cochran and Scotland-based W2E Engineering, experts in turning waste into electrical energy via gasification. The agreement will see W2E providing Shanghai Huanan with some $60 million worth of business per year for 10 years, he said. The work will be carried out in Annan, Dumfriesshire, and at a new facility in China. "China already has the largest deployment of onshore renewable technology and Scotland is a world-leader in pioneering the technology and the application of clean, green energy," Salmond said. Shanghai Huanuan's chairman said the deal would see the creation of new green power stations built in Scotland and in China. Li is due to meet British Prime Minister David Cameron and other senior government ministers during his visit to Britain, which is focused on trade and business links.